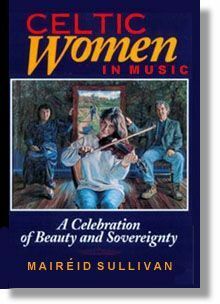 Celtic Women in Music - a Celebration of Beauty and Sovereignty, Published by Quarry Music Press (1999), profiles the careers of thirty one artists, singers, musicians, and composers in the Celtic music genre. Based on exclusive interviews, these musicians reveal the devotion to traditional Celtic culture that inspires their art and the sense of personal sovereignty that informs their lives as women. Over sixty women from all over the Celtic World, Wales, Brittany, Scotland, Ireland, United States, Canada, and Australia, have been interviewed for this collection. Thirty women are featured in Volume One. Volume Two will be published soon.